This article was last updated on the April 25, 2018. 1) Click on a page or post you want to edit with Cornerstone in the WordPress admin area. Above the WordPress editor and to the right you will notice a tab named “Cornerstone” next to the “Visual” and “Text” tabs normally found in the WordPress editor. Clicking the “Cornerstone” tab will reveal the “Edit with Cornerstone” button for you to click to take you to the editor. Once you have selected this “Cornerstone” tab, it will continue to be the option selected when available across your pages and posts. 2) If you are viewing a page or post on the frontend of your site and have the WordPress admin bar activated for your installation, you will notice a Edit with Cornerstone action in this admin bar when an entry is editable in Cornerstone. 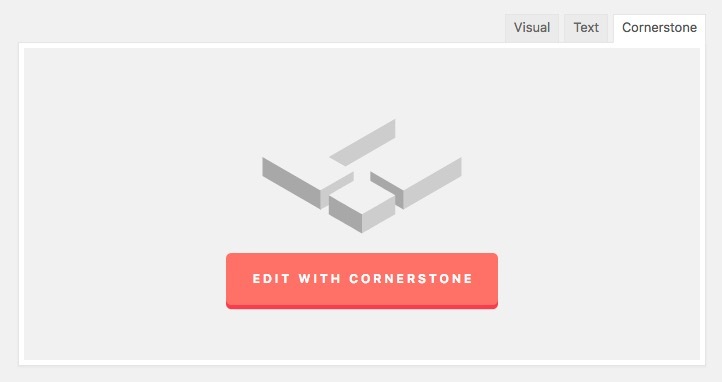 Clicking this button will activate the Cornerstone editor for that entry. To use the Cornerstone on a new page it is recommended that you first create the page and save and after that start to use the Cornerstone.